The catalyst for the successful Mexican independence movement was Father Hidalgo's call to arms. This bell in Guanajuato is supposed to be an exact replica of the one he rang to summon the peasants to overthrow the Spaniards. ¡Viva Mexico! Instead of finding random droolworthy accessories on the Internet and posting pictures of them, I thought I'd share some of the photos and treasures from my travels in Mexico. Enjoy! 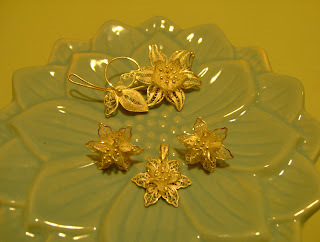 I bought these silver filigree blossom earrings, the pendant, and the brooch in Taxco. Taxco is a small colonial town about an hour's bus ride outside of Mexico City and is famous for its cheap sterling silver jewelry. The town used to be prosperous because of its proximity to the silver mines, but like most mining towns, after the ore ran out, the town hit a slump. The twentieth century saw the revival of Taxco as jewellers and artisans moved there and reinvented the town as a mecca for silver products. Even though I missed the open-air market which supposedly has the best bargains, there was still plenty there to tempt me. The delicacy of the silver filigree and those coiled silver threads took my breath away. "Hecho por mano," the sales assistants told me--all done by hand. 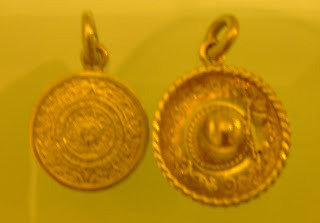 Two silver pendants from Taxco: the Aztec calendar stone and a silver sombrero. Note that this is the only sombrero I brought back with me. 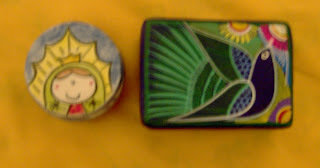 I bought the trinket box on the left from an artisanal market in San Miguel de Allende. On the lid is an adorable cartoonish representation of the Virgin of Guadalupe, who is regarded as Mexico's patron saint even though she's not officially canonized. According to legend, the Virgin appeared to a peasant named Juan Diego and asked him to have a church erected in her honour. Juan Diego described his miraculous apparition to a local priest; the priest asked him for proof. Juan Diego unfolded his cloak, which had been filled with roses the Virgin had given him, and imprinted on the cloak was an image of the Virgin. The original image from almost four centuries ago hangs in a basilica in Mexico City today. Its brilliance has not faded. Guanajuato was where I bought the other trinket box. It's a bit off the typical beaten tourist path but well worth going to. This colonial town is famous for its naturally preserved mummies (yes, you read that correctly...I said "mummies"), UNESCO heritage site status, and within Mexico, its performing arts festival. By the way, the big yellow building is the Basilica; its interior puts St. Patrick's Cathedral in New York to shame. Imagine having a wedding there, as one lucky couple was doing when I popped inside to admire the architecture. 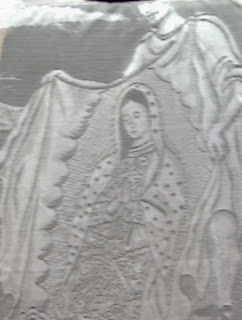 This lace shawl depicts Juan Diego unfurling his cloak to reveal the Virgin of Guadalupe's image. This amazing find was from an open-air market set up near the boats of Xochimilco. Agriculture proved to be a problem in the mountainous region where Mexico City is situated. The Xochimilca peoples (who pre-date the Aztec civilization) solved this dilemma by bringing the land to the water: they daubed dirt together into elaborate floating gardens resting on top of the shallow parts of the lake. Xochimilco is what remains of the floating gardens today. Here you can hire a pleasure boat with your friends or family to traverse the centuries-old irrigation canals, and just sit for the afternoon picnicking and drinking cheap litre cups of micheladas (beers with hot sauce, chili powder, lime juice, and salt mixed in). Food vendors and mariachi bands float by offering to sell you hot corn or a song for a few pesos. The district is notorious for lively parties thanks to the cheap alcohol and the local flavour. Update: I just came across this article about a bombing in Morelia during el grito yesterday that killed 7 people and injured about 100. What a horrible occurrence in a small colonial town when the public square is filled with families celebrating. My condolences go out to the victims. I love gold filigree . . . Thanks for sharing your pics and knowledge. Mexico truly has a rich heritage! I would love to visit someday. Happy Independence Day! Thanks CC! I'm still a little worn out from the festivities last night. The silver flower filigree is gorgeous! Those earrings look absolutely lovely. & I love getting tidbits on Mexico that you don't typically find from other's visits there.